The draw for Durham Autumn Small Boats Head is now available in PDF and XLSX formats (documents updated Friday 3/Nov 1pm). The draw for the Durham Long Distance Sculls event along with competitors instructions for both events can be found at NE Rowing. This entry was posted in Expired Announcements on October 31, 2017 by admin. The first medal in this year’s Head of the Charles Regatta in Boston, Massachusetts on October 21st went to GB’s Tom Bishop, competing for Quintin BC in the Veteran 70+ single sculls. Tom has connections with DARC dating from the 1970s. Formerly of Durham University he competed for DARC at the 1972 National Championships at Holme Pierrepont, Nottingham, taking a silver medal in the double sculls along with Geoff Potts. In the same year he was a member of the DARC Eight that took part in the Head of the River Race, the first time for 14 years that the club had fielded an eight in the race. In 1973 he married Durham University graduate Diana Preston, who he had coached the previous year when she became DARC’s first international, representing GB in a single scull at the European Women’s Championships in Brandenburg, East Germany. At this time women members of the club were classed as associates and had no voting rights. The club only agreed to full voting rights for women at the 1975 AGM. Both Tom and Diana then went on to represent Great Britain at the 1976 Montreal Olympics. After starting a family Diana took a long break, only returning to rowing recently. Since moving to Quintin Tom has teamed up with DARC veterans many times, most recently in a composite Masters F quad at the 2017 World Masters Regatta in Bled. This entry was posted in Club News on October 31, 2017 by Colin Lawson. Quintin Boat Club has announced the death of Geoff Potts on October 28th following a heart attack while coaching in a launch at Mortlake Anglian and Alpha BC. His association with Quintin began in the 1970s and lasted until around 2 years ago when he moved to MAA. 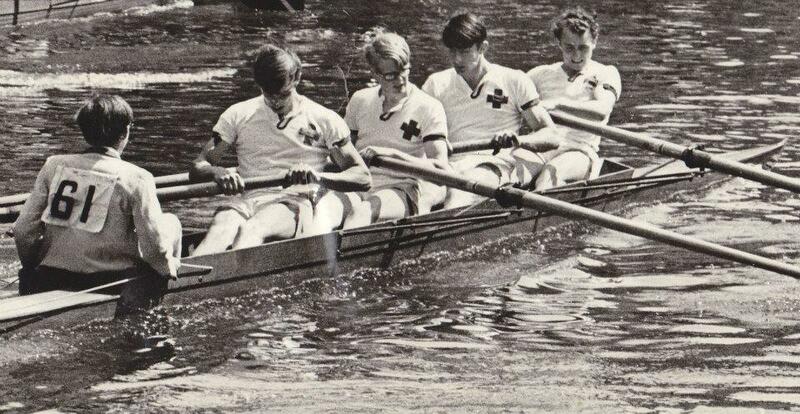 Geoff Potts started rowing at Durham School in the 1960s and, along with John Appleby, Gareth Powley, George Nicholson and Tony Bailes, was a member of the coxed four victorious in the Grand Challenge Cup at Durham Regatta in 1966. The winning crew was to be reunited 50 years later as special guests at the 2016 Durham Regatta. 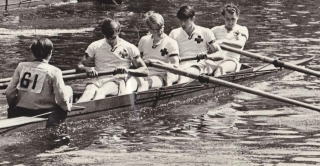 After leaving school Geoff went on to Durham University and rowed, along with Bill Grant, for DUBC at Henley Royal Regatta between 1968 and 1970 before initially joining Tees Rowing Club where he started his sculling career. In 1972 a DARC eight competed in the Head of the River Race for the first time since 1958, starting 255 and finishing 35th. The crew comprised Kim Metcalfe, Tom Bishop, Mike Matthews, Fred Snowdon, Ian Shepherd, Bill Grant, Geoff Potts, John Appleby and cox Andy Jaggard. Later the same year when the first National Championships was held at the new 2000 metre course at Holme Pierrepont, Nottingham, Geoff Potts and Tom Bishop took the silver medal in the double sculls. Then in 1974 Geoff was selected as Great Britain Lightweight Single Sculler at the World Rowing Championships in Lucerne, Switzerland, the first time that the Championships included events for lightweights. Becoming DARC’s first male international Geoff won the first ever WRC lightweight race and went on to finish 4th overall. After relocating to London he continued to be acknowledged as a very accomplished veteran sculler at Quintin as well as being highly regarded as a coach. This entry was posted in Club News on October 29, 2017 by Colin Lawson. Plaudits have been flowing in for Gordon Beattie after he was given the accolade of Coach of the Year for the Durham and Chester-le-Street area in the annual County Durham Sport Awards on October 27th. Gordon has been coaching for over 40 years as well as carrying out many other duties around the Club on a voluntary basis, and had been looking forward to a well-deserved rest until being persuaded to cycle up and down the riverbanks of the Wear for one more year, helping Hope Cessford achieve her aim of selection for the GB Junior squad for the second successive year. Hope was selected for the GB coxless four that won the B final at the World Junior Championships in Lithuania in August. She spoke of Gordon as the most influential person in her life. ‘He has taught me the meaning of hard work, dedication and what it takes to be a successful athlete whilst also being a shoulder to cry on’. Award winners from each of the 4 geographical areas go forward to the County final at the Gala Theatre on January 26th 2018. This entry was posted in Club News, Uncategorized on October 29, 2017 by Colin Lawson. Entries for Durham Autumn Small Boats Head are now closed. The draw will be available on or after October 31st 2017. This entry was posted in Expired Announcements on October 28, 2017 by Colin Lawson. As Durham Autumn Small Boats Head on November 4th has almost reached capacity we have added a second division. See poster for details. This entry was posted in Expired Announcements on October 19, 2017 by Colin Lawson. The final round of the 2017 Explore Series took place at Tyne United on October 1st. It was a successful day for DARC with the women’s crew ‘A Shot in the Darc’ (Alison Shepherd, Sue Lyons, Jane Auster, Kalpana Ganatra and Margaret Richardson) winning all four of their races to clinch top place with 50 points in the women’s league, while Wear Well Away (Colin Lawson, Vaughan Gordon, Chris Merchant, Steve Auster and Dave Green) won 3 races to finish as runners-up in the Open league on 46, 4 points behind Hexham who have led all season. Despite being on half points for the round Green Shoots (Zuzanna Swirad, Paddy Deans, Linda James, Alison Hoare, Maureen Miller, Louise Forster and Kate Wicks) secured 2 points, enabling them to take fourth place by half a point in the women’s league. A total of 37 teams from 10 different clubs have taken part this year, the second successive year in which a DARC Women’s team has won the league. This concluded the sixth season of the Series which started as the Sunday League in 2012. The competition is for novice, recreational and returning rowers and retired racers. This entry was posted in Racing News on October 4, 2017 by Colin Lawson. Jo Beverley of the Stroke Association visited Durham ARC on Monday to join members of the club’s daytime rowing group for coffee and to receive funds donated. The group took part recently in the Great Tyne Row in aid of the Stroke Association, raising £1572 for the charity. The Club entered 3 stable coxed quads in the event on September 2nd, a 25km challenge on the River Tyne starting from Newburn and finishing on the beach at Tynemouth. The 15 crew members chose to support the Stroke Association as two of the participants had previously had strokes and rowing has helped with their recovery. To further raise awareness the 3 teams adopted names with stroke connotations, ‘30 strokes a minute’ and ‘The F.A.S.T crew’ completing the 25km in an identical time of 2 hours 13 minutes, and ‘Stroke ‘n’ Recovery’ finishing in 2 hours 51 minutes. Crew members are pictured above with one of the boats preparing for the event and with Jo Beverley on her visit to the club. This entry was posted in Club News on October 4, 2017 by Colin Lawson.